In 2011, The Martin Luther King, Jr. Center gave Ben & Jerry’s one of its highest honors. This book explains why. The pioneering experience of Ben & Jerry’s shows that corporate social responsibility can, thankfully, be contagious. Brad Edmondson takes us behind the scenes to tell this riveting and timely story. 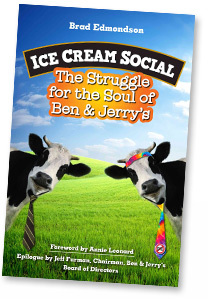 This book reveals the true ingredients that go into every pint of Ben & Jerry’s: GMO-free cream, fair-trade cane sugar, and a lot of blood, sweat, and tears. A fascinating business morality tale . . . Edmondson offers an entertaining and enlightening account of the highs and lows that can be encountered in the quest to give capitalism a soul. Ice Cream Social is a factory tour of the ups and downs and arounds of Ben & Jerry’s. We get an insider’s description of the struggle of two guys who strived through good times and bad to achieve their mission to make the world’s best ice cream, pursue social change, and treat both employees and shareholders fairly. Much of the time, they succeeded. When Calvert ﬁrst heard about Ben & Jerry’s, we wondered whether our mission of social investing could even include a company that sold ice cream treats. This book shows how the founders convinced us. For decades, they have been a stellar example of walking the talk.